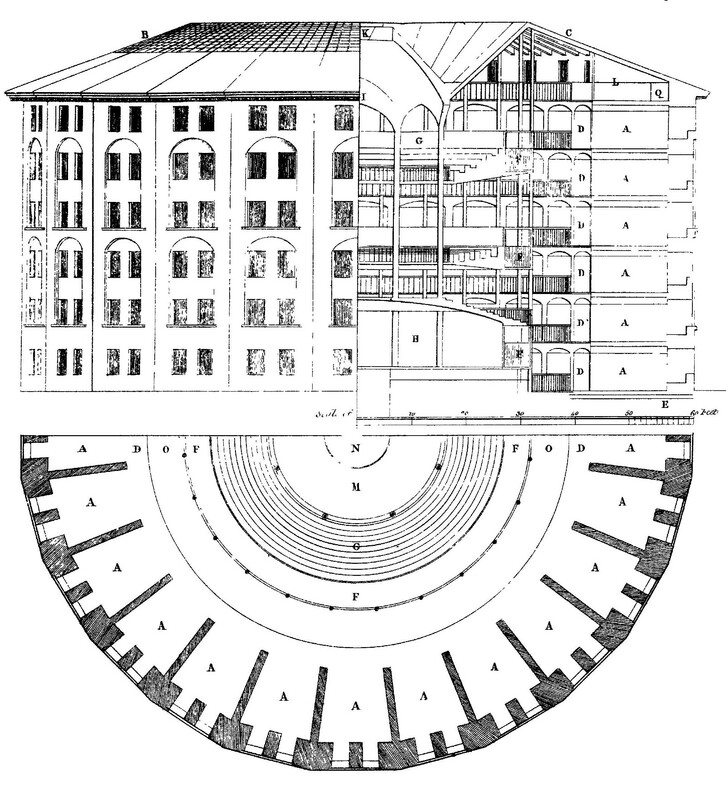 The panopticon penitentiary, from the Greek παν- (‘all’) and -οπτικος (‘seeing’) was based upon an idea of Jeremy’s younger brother, Samuel, who while working in Russia for Prince Potemkin, hit upon the ‘central inspection principle’ which would facilitate the training and supervision of unskilled workers by experienced craftsmen. Jeremy came to adapt this principle for his proposed prison, an ‘Inspection House’ envisaged as a circular building, with the prisoners’ cells arranged around the outer wall and the central point dominated by an inspection tower. 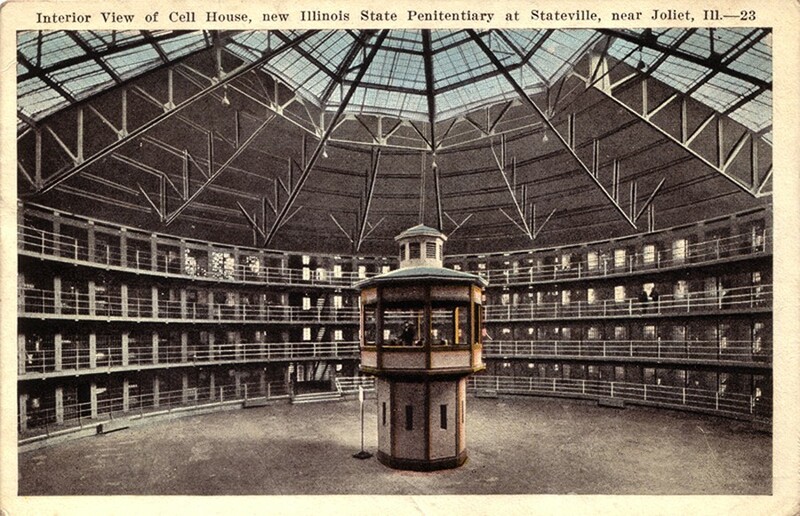 From this building, the prison’s inspector could look into the cells at any time — and even be able to speak to the prisoners in their cells via an elaborate network of ‘conversation tubes’ — though the inmates themselves would never be able to see the inspector himself. Assuming that the omnipotent governor was always watching them, Bentham expected that this ‘new mode of obtaining power of mind over mind, in a quantity hitherto without example’ would ensure that the prisoners would modify their behaviour and work hard, in order to avoid chastisement and avoid punishment. 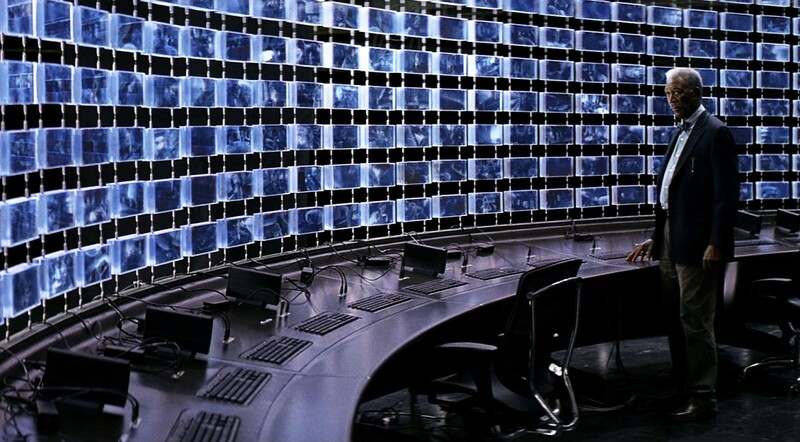 The idea of constant, overbearing surveillance is certainly unsettling, but the panopticon and its central inspection principle would, Bentham argued, have multifarious benefits. It’s become a cultural poster-boy for them watching us, used in everything from real prisons to superhero films. What I started thinking about after listening to the podcast is how it’s another useful illustration of how the internet has really changed the way we have to think of cultural and spatial constructions. The thing that makes The Panopticon work as an idea for Bentham is the physical tower in the centre, a place from which all is seen. It also infers that, due to the way spatial relationships work, the smaller tower inside the larger circle will contain fewer people. There’s an inherent power-dynamic suggested by the physical; the few must observe the many. As Walker points out, the way we use the digital landscape means there is a form of ‘user-generated’ surveillance at play nowadays, as we happily make visible things, posting pictures of puppies to the walls of our ‘cells’, as it were. Which means we can see everyone else’s cells too, which breaks the Panopticon metaphor from the off, really. But that notion of a physical tower in the centre doesn’t really hold now, either. Depending on circumstances, the many are observed by the few, or the few are observed by the many. We are not bound by particular shapes and spaces. And it clouds our thinking when we force physical metaphors onto things; we need new ways to describe and think about these new forms.